Christmas is one of my favorite holidays. I love the smell of Christmas trees, the sparkling lights, Christmas markets… I also love all the traditions that are associated with it. And I love that the holiday season lasts for a full month. In short, I love Christmas. With the big holiday less than two weeks away, I should be out and about soaking up the holiday spirit. But I’m not. I’m sitting home with the flu. That puts a bit of a damper on my jolliness, but there are lots of Christmas shows on TV so that helps a bit. I’ve written a lot about Christmas in the past, so this week, I’ve put together a list of my Christmas articles that I thought you might enjoy. Also, don’t forget that you still have time to enter the drawing for a free e-book. Either a South of France Christmas novel, The First Noël at the Villa des Violettes, by Patricia Sands or my latest book, Berets, Baguettes, and Beyond. See the details at the bottom of this post. If you’re wondering where jolly old St. Nick originated. Read all about it in St Nicholas… Santa Claus… Father Christmas. Then read about St Nick’s French donkey and the many benefits of mistletoe in Mistletoe and a Flying Donkey. In the Western World, many Christmas traditions are fairly similar from country to country. However, each nation also has some customs that are particular to it. A typical British Christmas just wouldn’t be the same without some special holiday desserts. Read about two of them in British Christmas Pudding and Pie. And for something to drink on a cold winter’s day when you are browsing the markets have a look at Wassail and Wassailing. Christmas is a time for parties and one item which shows up at every holiday gathering is the Christmas Cracker (not the kind you eat). And it just wouldn’t be Christmas in the UK without the Christmas Panto. These silly shows delight children and adults alike. In the South of France, find out why the Provence Nativity scenes include the whole town in The Little Saints of Provence and the Provence Christmas Story. 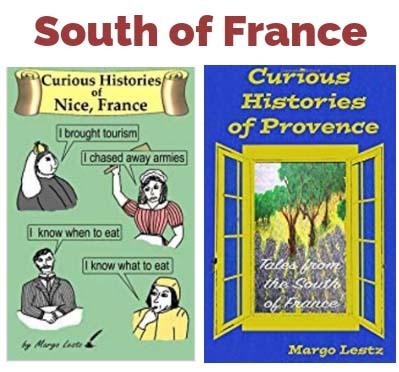 Then find out why those people of Provence have so many desserts at their holiday dinner in Thirteen Desserts: That’s My Kind of Meal. Moving up to the North of France, read about Father Whipper: St. Nick’s Evil Helper. But Barcelona, Spain takes the prize for a really strange Christmas tradition in Happy Crappy Christmas. 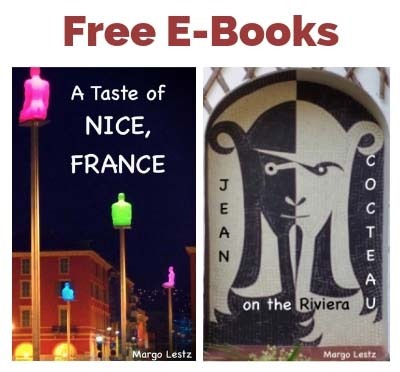 Berets, Baguettes, and Beyond – I’m also giving away two free e-books of my latest publication. If you love France and are curious about all things French, this book is for you. 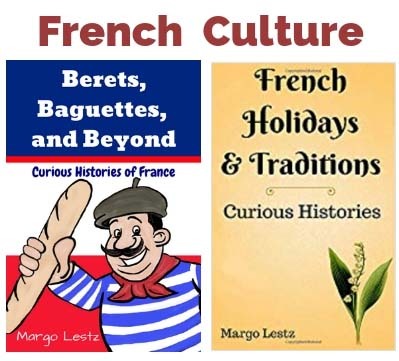 In it you’ll find stories exploring the curious histories behind everyday French symbols: From berets to baguettes, and beyond… Click here to read more. If you would like to win one of these e-books, just click here to go to the contact form and send me an email. Winners will be notified on December 21. Good Luck! And remember that books make great Christmas gifts too. Next Post: What is Boxing Day all About? I am sorry that you are not well, when, as you say, you could be out enjoying the Christmas Season. It is so different in Australia, but interesting that we follow the English traditions in the main, however we have a lot more evening outside events, taking advantage of the warm, longer days. Hope you are well again very soon. Thanks for the well wishes. I’m starting to feel better so I might get a little holiday spirit in yet.